As a subtle yet unmistakably cool departure from the norm, square watches can make an intriguing addition to any collection. There have been a number of square designs over the years, little islands in the endless sea of circular faces, but only a few have truly reached iconic status. The ones that have are some of the most recognizable pieces ever created; models crafted by legendary watchmakers or else permanently associated with fabled pop culture figures. Like their rounded counterparts, different styles of square watches match different occasions, from dressy to sports to all-out tool models. Below we’ll take a look at some of the most famously hip examples of square timepieces. Where legendary square watches are concerned, there is really only one place to start, and that place is 1904. In an era that gave birth to the first daredevils of aviation, among the earliest pioneers, and one mentioned in the same breath as the Wright Brothers, was Alberto Santos-Dumont. The son of Brazilian coffee plantation owners, Santos-Dumont was enthralled by the idea of flight from a young age and emigrated to Paris, where he went someway to scratching his itch by piloting airships above the city’s streets. He would go on to win the Deutsch Prize for flying between the Eiffel Tower and the Parc Saint Cloud, and back, in under half an hour. The problem he had, or one of them anyway, was timekeeping. Wristwatches of the period were flimsy, delicate items and the sole reserve of aristocratic ladies. Santos-Dumont, like all men, wore a pocket watch. But needing two hands to operate it to keep track of his flight time meant taking them both off the controls of his aircraft—a potentially deadly operation. Enter close friend Louis Cartier. In 1904, he would create the first pilot’s watch and, in fact, the very first purpose-designed wristwatch, specifically to aid Santos-Dumont. The Cartier Santos is the only piece from the maison to be named after its original wearer. With Santos-Dumont’s popularity as a public figure in Europe, along with his charismatic personality, the square watch on his wrist gained an instant appeal, but didn’t go on sale until 1911 when Cartier teamed up with Edmond Jaeger to mass produce the movements. It is a design that has gone relatively unchanged ever since. That softly squared case even survived the two world wars, when the vast majority of the wristwatches being produced were round by necessity for military forces. The unashamedly luxurious model received a major shakeup in 1978 when a more affordable steel and 18k gold ‘bimetal’ example was released, as opposed to the all precious metal versions it had been available in until then. Following closely behind was an all steel piece; a Santos for the welcoming masses. Today, it has continued to evolve and is available in a range of styles and sizes. 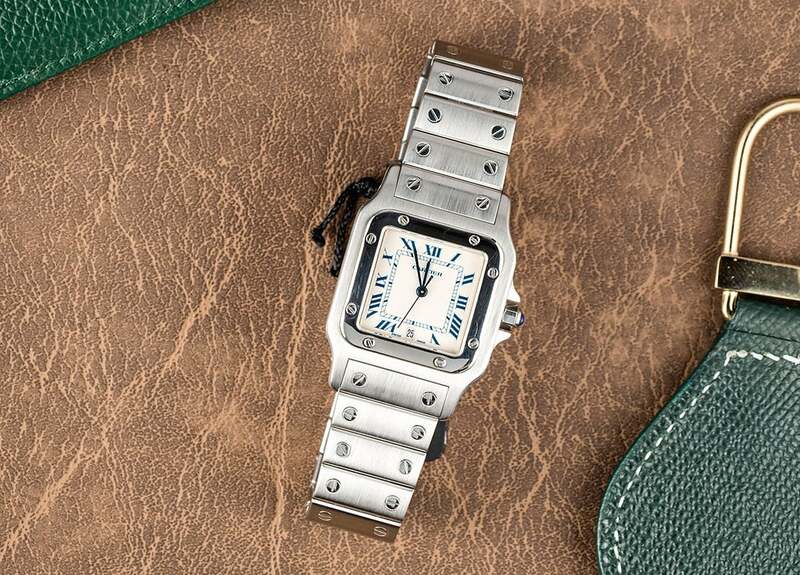 This year’s Baselworld saw another new collection make its debut, and Cartier unveiled their novel QuickSwitch bracelet swapping system to allow wearers to change up their look in a hurry. 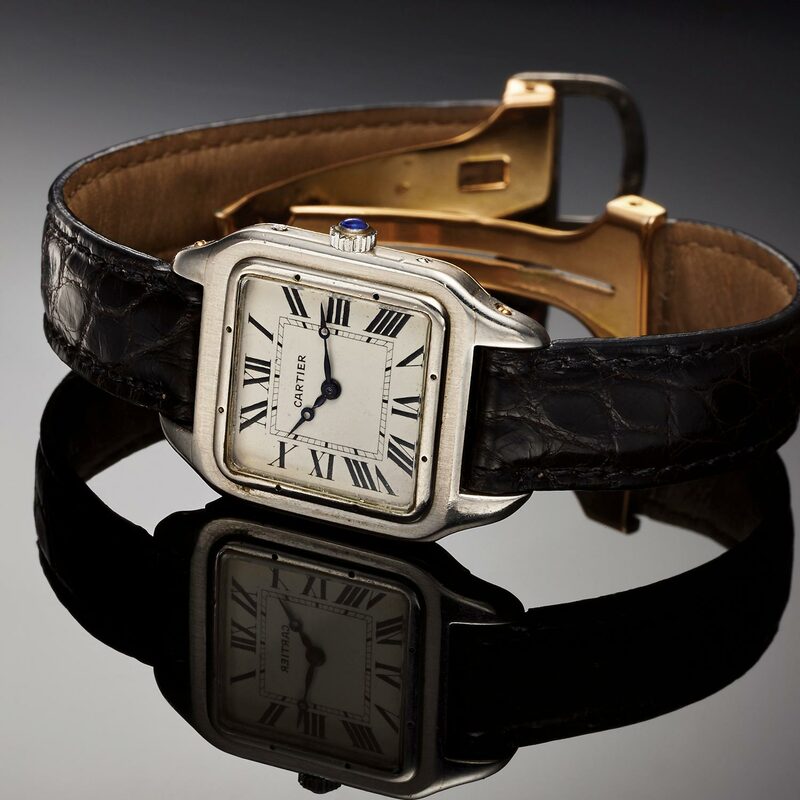 While its pilot credentials may have been lost to the mists of time, there is no doubting the Cartier Santos is one of the most important wristwatches ever made, and it is one still thriving today. Same planet, but a different world from the Cartier Santos, the Bell & Ross BR 01 series are unmistakable square watches for the contemporary professional aviator. With flight now an integral part of modern day life, rather than a pastime of the idle rich, the watches pilots wear have progressed almost as much as the aircraft they operate. Such is the case at Bell & Ross. A young company in horology terms, they have been disrupting the industry since they emerged in 1992, formed by two university friends, Bruno Belamich and Carlos A. Rosillo. Sharing a vision of making tough, robust watches, the overriding B & R philosophy of function dictating form brought the pair to design the distinctive BR 01 and smaller BR 03—the ‘circle inside a square’ aesthetic inspired by the instrumentation of modern aircraft. 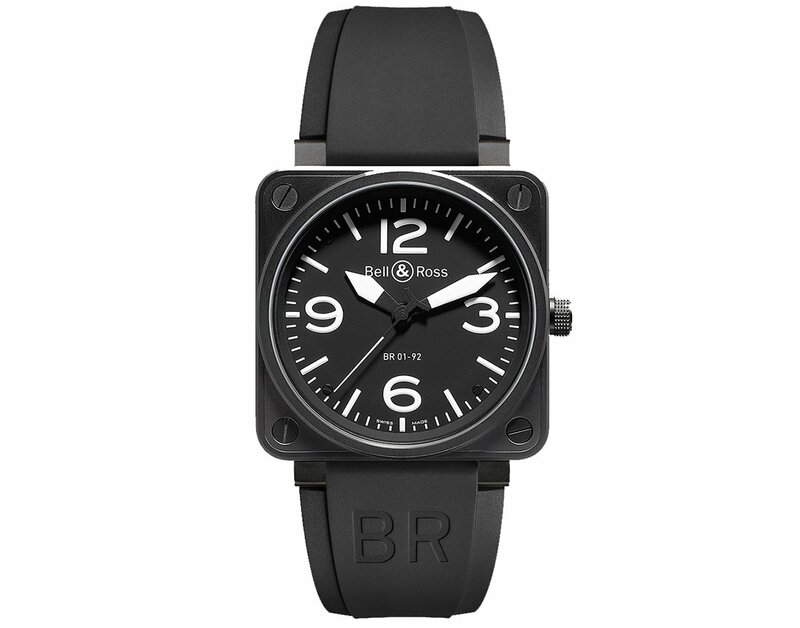 First launched in 2005, the BR 01 arrived sporting a huge 46mm case, with the same matte black and white color scheme used in cockpit dials to afford maximum contrast and eliminate glare. The highly unconventional styling won as many detractors as fans, but no one could deny the striking presence of the watch—a scaled down wrist clock that looked like it could have been lifted straight out of the instrument panel of a P-51 Mustang. The collection has since gone on to diversify into a number of different ranges, from the extremely useful like the dual time zone BR 01-93-GMT from 2013, to the strange and whimsical, such as the lavishly decorated Skull concept models. Yet they all share the same brand DNA; ultra strong, reliable timepieces that are more than a match for the worst life can throw at them. There’s a reason that Bell & Ross are official suppliers of France’s Air Force, bomb squad and the country’s equivalent of the U.S. SWAT teams, RAID. 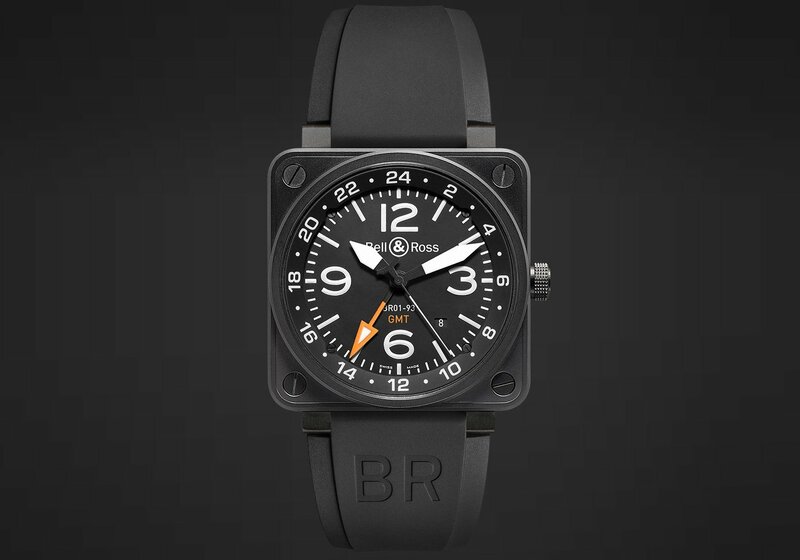 With its unorthodox looks, the BR 01 series is a decidedly masculine entry into the square watch canon, an instantly recognizable emblem, and one destined to be with us for many years to come. From the skies to the racetrack, the Heuer Monaco may well be the most famous of all square watches. And, like its contemporary the Rolex Daytona, another model given a name steeped in motor racing tradition, the Monaco owes much of its status to Hollywood royalty. 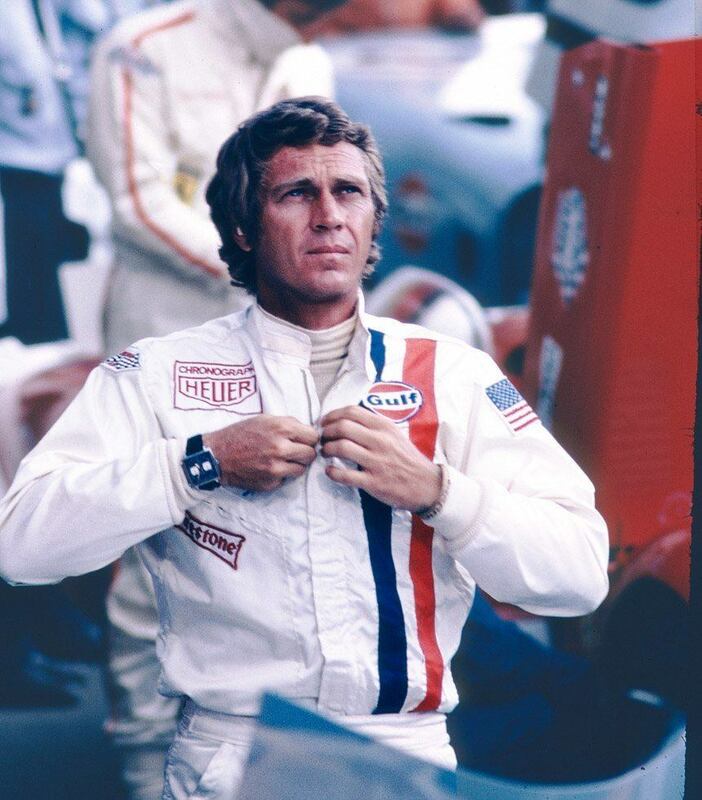 Where Rolex’s flagship chronograph became instilled in the horology psyche thanks to the significant weight put behind it by Paul Newman, the Monaco owes its place in watchmaking iconography to one Steve McQueen, who immortalized the piece when he wore it throughout his 1971 outing Le Mans. Interestingly however, the Monaco was never really designed for the track. There was, after all, no need for another Heuer racing watch; the brand already had the Autavia and the Carrera for that. What the Monaco did provide was a thoroughly modern, avant-garde case into which could be slipped the shiny new Caliber 11, the first (or second, or third, depending on where your loyalties lie) automatic chronograph movement. The three-way battle between the Caliber 11, the Zenith El Primero and Seiko’s 6139 has been too close to call since its photo finish in 1969, and each could lay a claim to having crossed the line first, based on various points of view. Regardless, the only reason the Monaco became so inescapably linked to McQueen was simply because it was the only model the prop-master working on Le Mans happened to be able to secure three examples of— one for McQueen to wear, one for close-ups and another as a backup. That history is now nearly 50-years old, and TAG Heuer (as they have been called since 1985) have released a number of tributes to that original blue dialed model, the ref. 1133B. The most faithful arrived in 2015 with the ref. CAW211P, a more or less carbon copy of the watch McQueen wore, with all the salient details present and correct. Like that first piece, the latest Monaco has its crown on the left, it does away with any numerals on its circular minute track, with just an applied marker every hour, and the central hands are given familiar splashes of red. 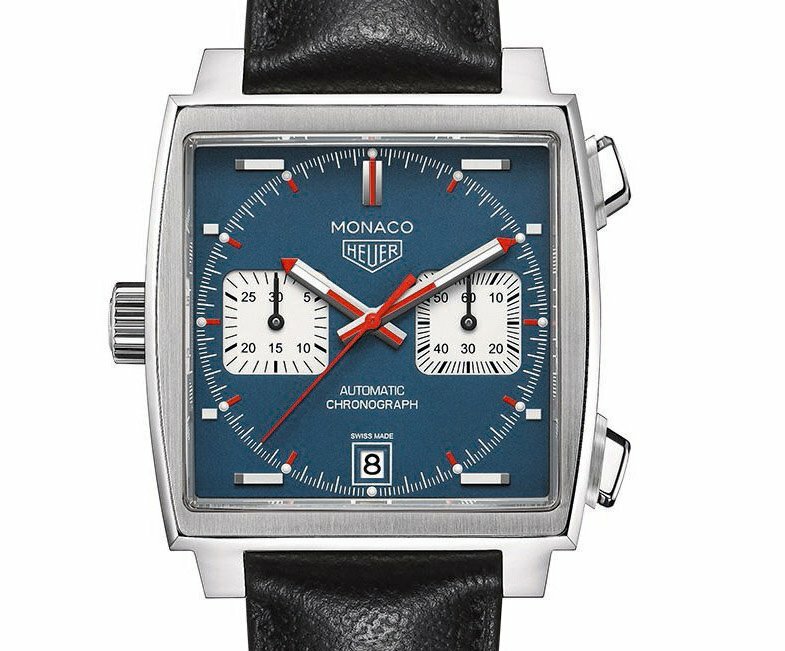 They have even named it the TAG Heuer Monaco Caliber 11, somewhat misleadingly considering it’s powered by the Sellita SW300 automatic movement, with a Dubois-Depraz chronograph module. But whether old or new, the Monaco represents one of the most immediately identifiable square watches ever made—and one that gained a seal of approval from the King of Cool himself. As recommendations go, it doesn’t get any better than that.